Pop the bowl in the freezer for 24 hours, take it out and this clever machine will whip up delicious homemade ice cream, frozen yogurt and sorbet in just 45 minutes. From experience, you will use it once or twice then it will gather dust, great in theory but a pain in practice. From experience, you will use it once or twice then it will gather dust, … From experience, you will use it once or twice then it will gather dust, great in theory but a pain in practice. I don't think 1 L of ice cream is just for one person, unless you are a supreme ice cream fan. I could never sit through a whole tub of Ben and Jerry's, let alone two. You must really like your ice cream! I think it comes in quite handy for the upcoming heat wave, when the freezers at the supermarkets will be empty. The video they show seemed to produce very runny ice cream!! Any actual users of this maker here? 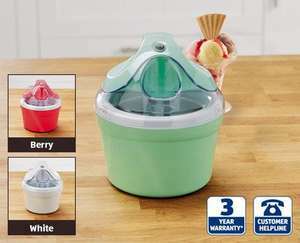 Pop the bowl in the freezer for 24 hours, take it out and this clever … Pop the bowl in the freezer for 24 hours, take it out and this clever machine will whip up delicious homemade ice cream, frozen yogurt and sorbet in just 45 minutes. Or you could just put whatever you want to eat in the freezer for those 24 hours and save yourself a hassle of cleaning this contraption. On the other hand I just threw away that juice making machine we bought 9 years ago and used twice and this could fill new gap in the cupboard perfectly. Or you could just put whatever you want to eat in the freezer for those … Or you could just put whatever you want to eat in the freezer for those 24 hours and save yourself a hassle of cleaning this contraption. If you put custard in the freezer without churning it, well it won't exactly be ice cream. guess you never made ice cream then as this will not work as you will get huge ice crystals forming unless you remove it from the freezer and whip it a few times as it freezes which is what this machine does. 1. Cut up into pieces approximately 1/3 of a single sheet vegetarian gelatin. 2. Heat the milk (don't boil) and add the gelatin. 3. Stir throughly until dissolved and allow to cool in the fridge, preferably overnight. It will take on a jelly-like consistency, this is normal. 4. When cooled add to the mix as per instructions. Yep...used mine twice. The biggest pain is finding room for the bowl in the freezer.